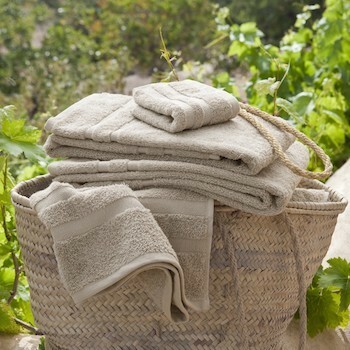 A more economical way to shop our Olivo towel set in a beige 'noisette' colour is comprised of 2x bath sheets, a bath mat and hand towel. 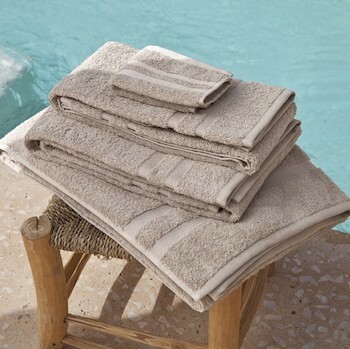 This towel set is a simple luxury for individuals and families alike. 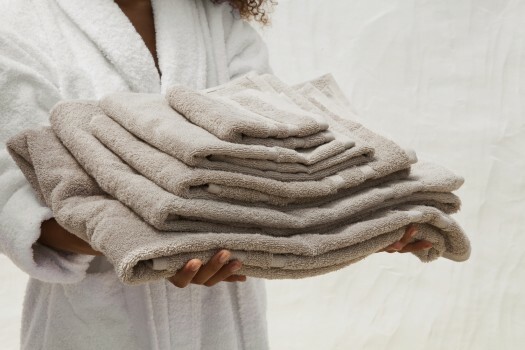 Our towel sheet sets in beige are made in Portugal from 100% Egyptian cotton 600 GSM, feel full and soft while highly absorbent, quick drying and colour fast. With a classic double border jacquard trim, you can add to the look with the variety of sizes and colours available in hand towels to bath sheets size. Where modern comfort meets old age traditions, DEIA Living bathrooms are influenced by the Mediterranean sun, a touch of sensuality and a pinch of salt. DEIA Living bed and bath linen means waking every day to be embraced by soft fine cotton as if on the first day of vacation. Remember the bright blue sky, the sound of the ocean, the smell of freshly brewed coffee lingering in the air. Yes, that´s right, that feeling of absolute relaxation! Our desire is to embody these simple yet important moments so every morning is a tranquil start to your day.